i had bought this model for that purpose. but it is so comlete and without paint damage,i just keep it like that. also of the whole model i just need the cab and the front piece of the chassis. but this is how it should be looked like. 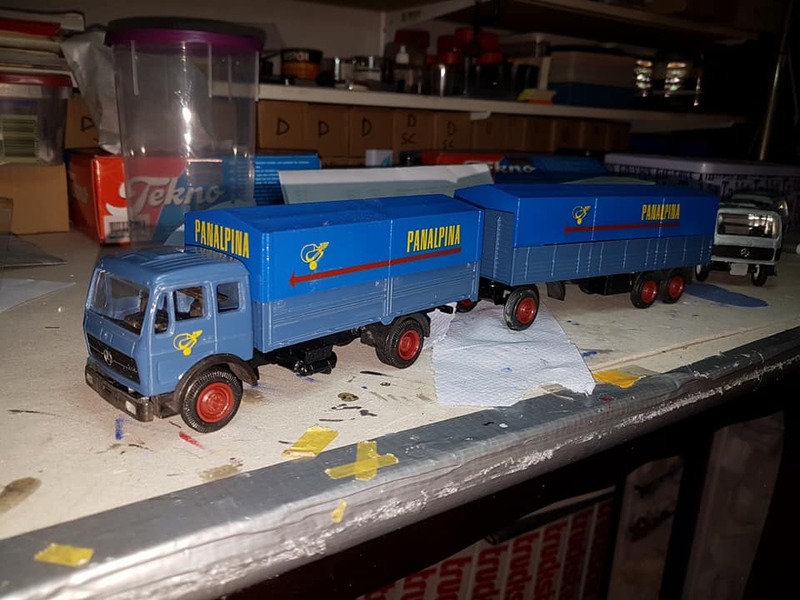 only the trailer get the same lenght as the truck,i do have those extra freight loading platforms and the extra chassis. (but cant find them) i have to make them a little bit longer. 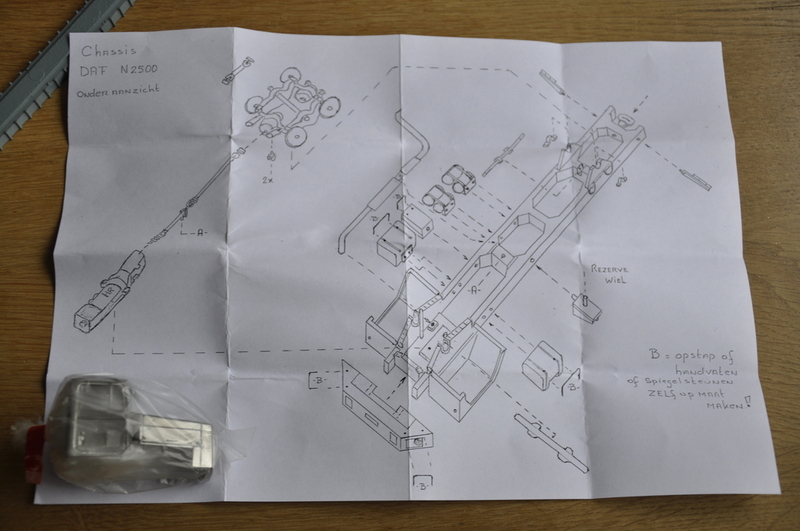 facebook remembers me that today a year back i got those parts delivered. 4 loadingplatforms and 2 complete dolly trailers. 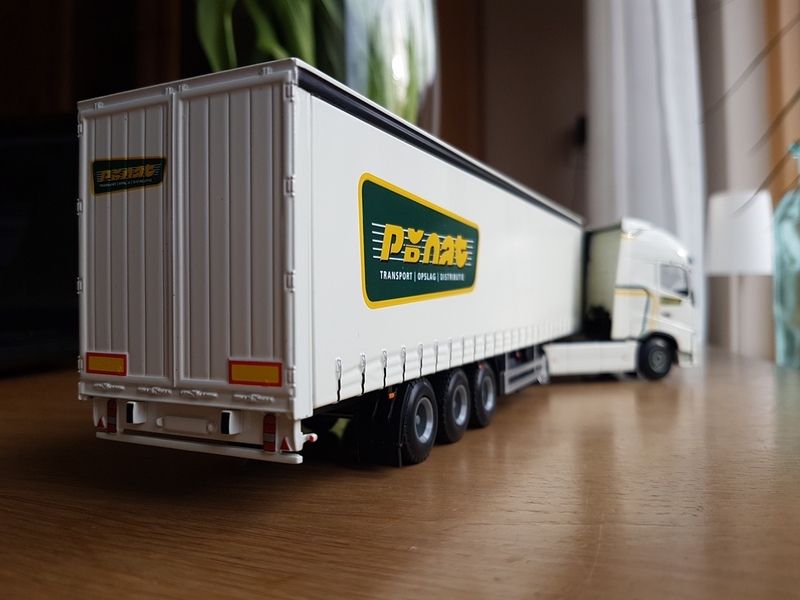 i orderd 2 dolly chassis too,but not available. so have to order new ones. Oh Thijs, they've got to be SOMEWHERE. Remember when you lost something a while back, searched everywhere but couldn't find it? Then one day there it was, underneath something else. Facebook reminded you that you certainly ordered the parts plus the date you did so. Have you by chance used them for something else instead? I'll have to get you a great BIG empty box and label it "All new spare parts IN HERE". 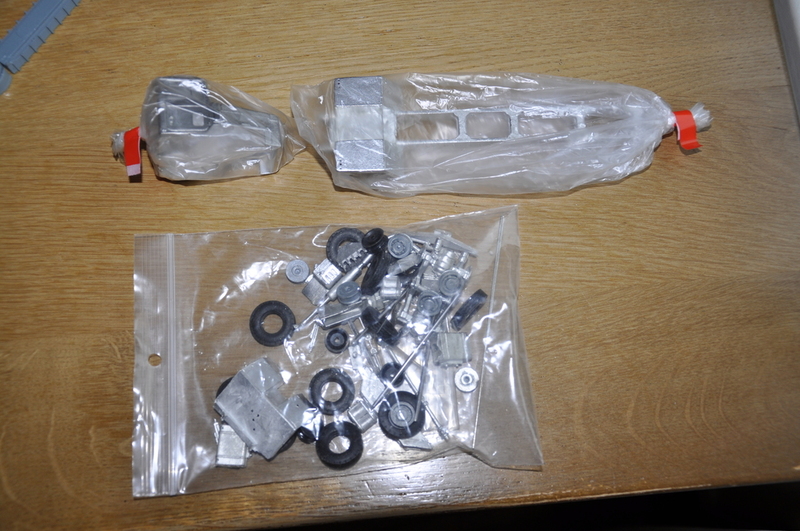 Then every time you buy parts, put them in there even if you intend to use them the next day. That way they won't get hidden under or behind anything else. Might you have put them downstairs somewhere? In the shed? I know i do some daft things sometimes and then can't imagine why I did them! Have one last try searching. Only do it methodically. Start at the end wall of the attic, examine every shelf, tin, box even if you think you are sure what's in there. Then slowly move around the room. Finally examine every thing on the floor in the same way. 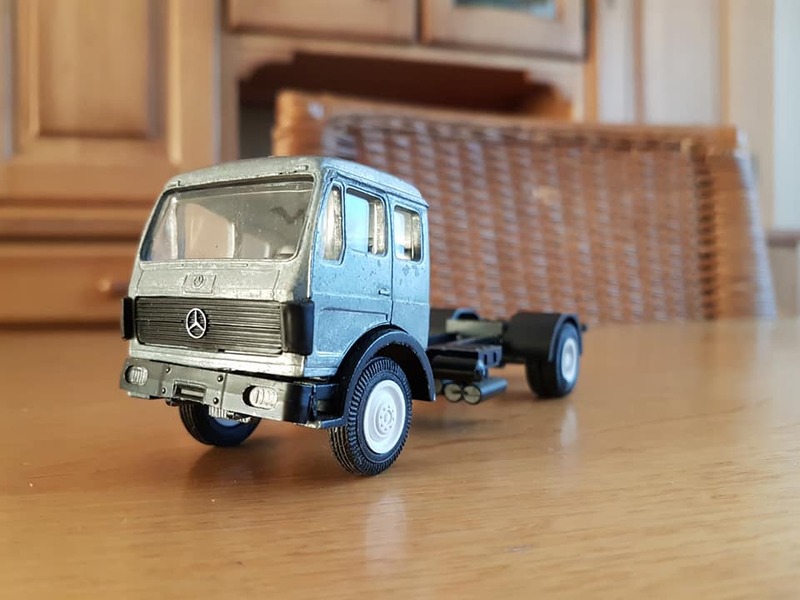 I don't have those dolly chassis. i thought i ordered them, but the seller diddn't had them anymore. but the 4 platforms and 2 dolly trailers i lnew where they were. i have such a big box. 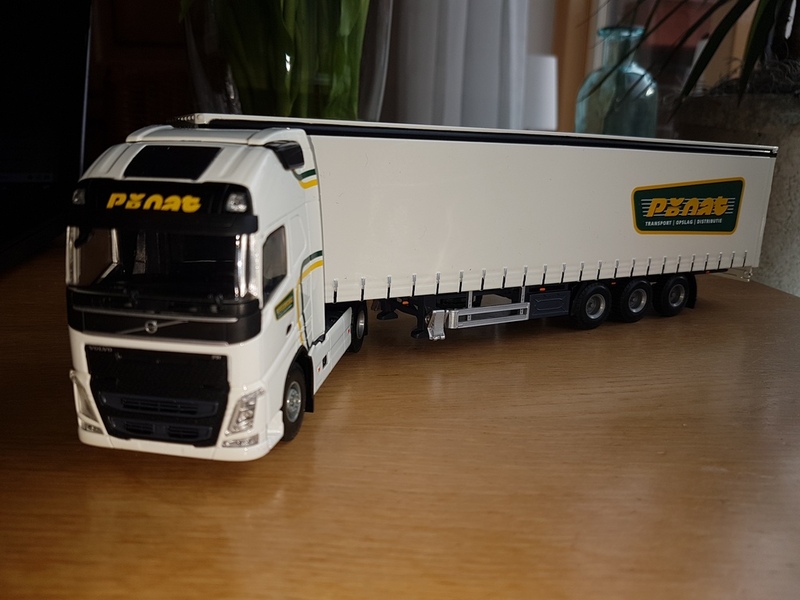 why such a simple model, basicly for the companies color and name, it's a company from here in Giessen and i have already 4 models of them,so to complete the set. 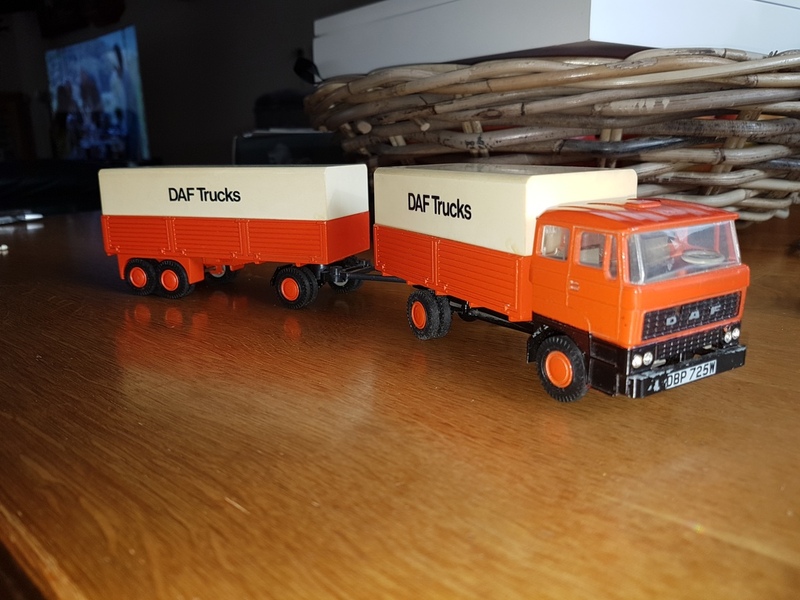 but also bought me a DAF model. 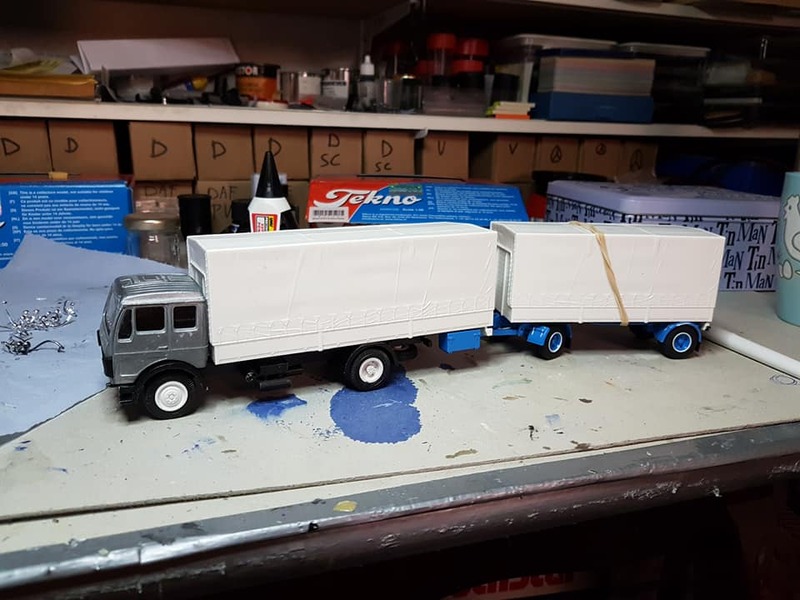 i want this one ,because my uncle had such one too, as a few pages back you could see that i made a 6 axle truck with trailer (and sinsce then i did nothing anymore at it) of my uncle,he had this 5 axle truck with trailer before the 6 axle. 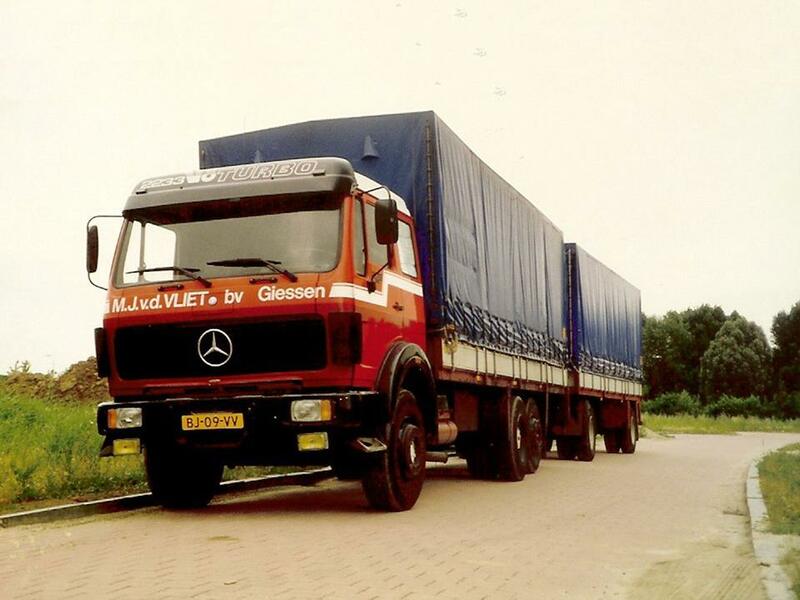 trailer is the same,trailers mostly go after 2 or 3 following trucks. 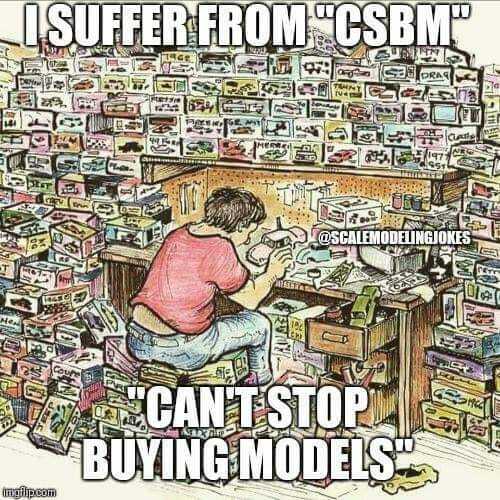 so just buy it to have it when i want to build it. looking after them at home,yes i do. 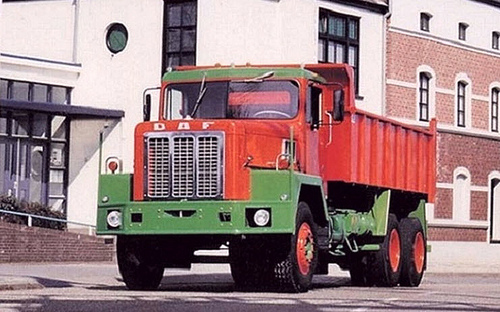 also 4 images of a DAF truck made in the time that DAF had a ''merger'' with International Harvester. in that time they build this model,but both parties wern't happy with each other. there are only a few build. 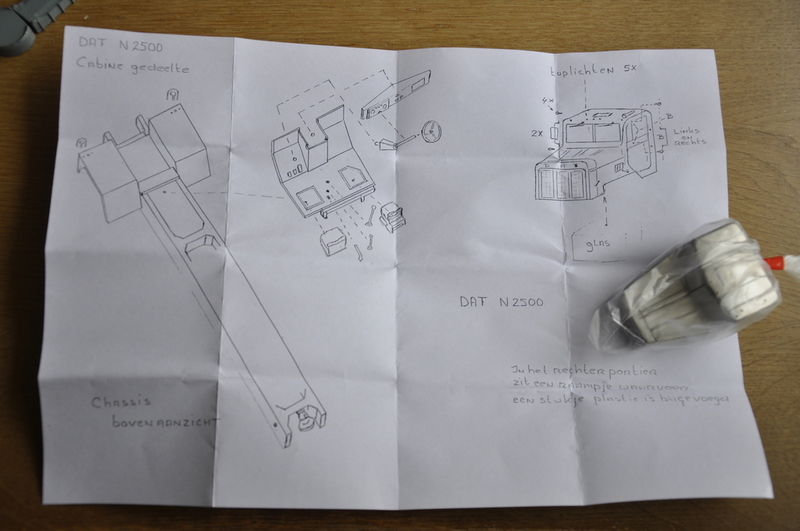 but march the 31 i go to the big fair to pick up a kit of that model.which is made by a small home factory. made them i small series. years ago i saw it to late,my pockets where already empty that moment. i never saw them anymore,2 months back i got a tip that they available again. a very bad disease indead. 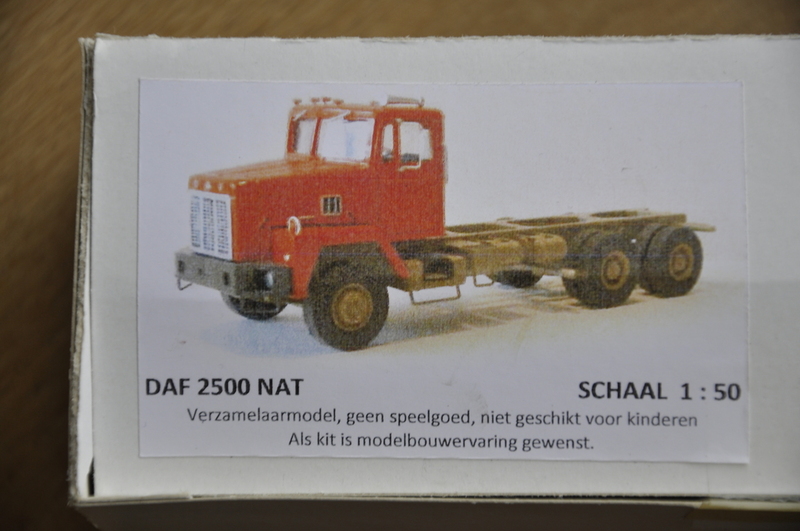 anf here is the kit of the model of the DAF. 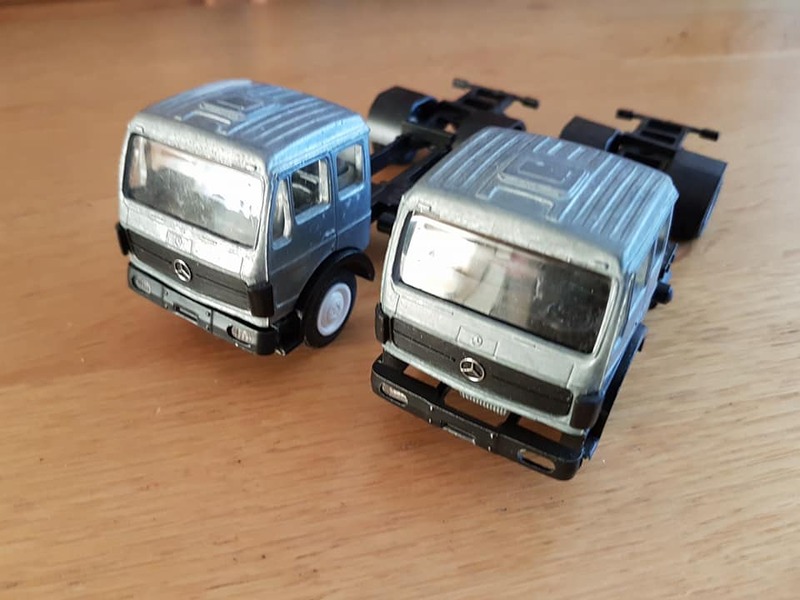 the same model of on the 4 images on post 625.
it's a tipper chassis,a long chassis. 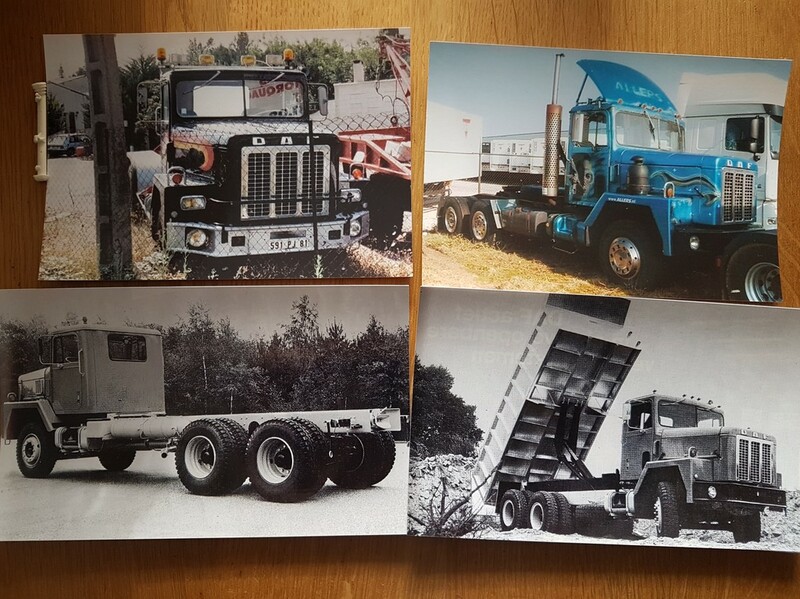 i'm thinking of making it a real American style truck with a big sleeper box,chassis is long enough for that. 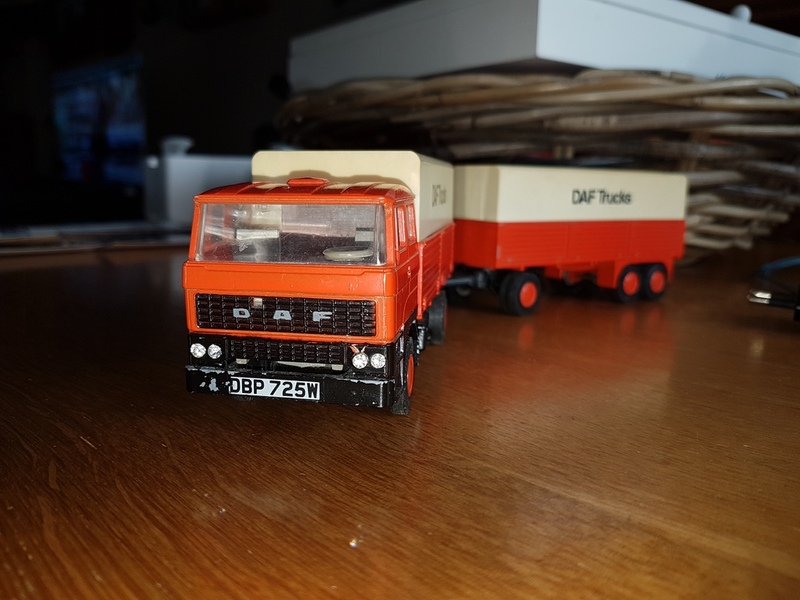 the Original truck is stored in the DAF museum depots. Paccar don't want's it in the museum.